Very Best Views of Pluto: This movie is composed of the sharpest views of Pluto that NASA’s New Horizons spacecraft obtained during its flyby of the distant planet on July 14, 2015. 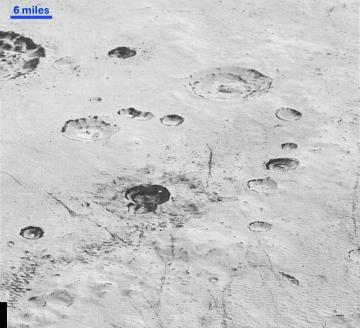 The pictures are part of a sequence taken near New Horizons’ closest approach to Pluto, with resolutions of about 250-280 feet (77-85 meters) per pixel – revealing features smaller than half a city block on Pluto’s diverse surface. 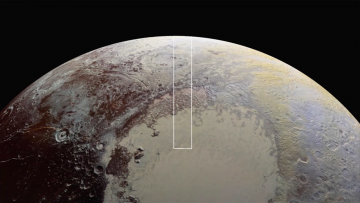 The images include a wide variety of spectacular, cratered, mountainous and glacial terrains – giving scientists and the public alike a breathtaking, super-high resolution window on Pluto’s geology. NASA’s New Horizons spacecraft has sent back the first few of a series of the sharpest views of Pluto it obtained during its July flyby – and this image sequence forms the best close-ups of Pluto that humans may see for decades. Every week the piano-sized New Horizons spacecraft transmits data stored on its digital recorders from its flight through the Pluto system on July 14. These latest pictures are part of a sequence taken near New Horizons’ closest approach to Pluto, with resolutions of about 250-280 feet (77-85 meters) per pixel – revealing features less than half the size of a city block on the diverse surface of the distant planet. In these new images, New Horizons captured a wide variety of spectacular, cratered, mountainous and glacial terrains. The images being released today form a strip 50 miles (80 kilometers) wide trending from Pluto’s jagged horizon about 500 miles (800 kilometers) northwest of the informally named Sputnik Planum, across the al-Idrisi mountains, onto the shoreline of Sputnik and then across its icy plains. A video made from these images reveals amazing details on a world 3 billion miles away – as do individual close-ups taken from the wider swath. The images are six times better than the resolution of the global Pluto map New Horizons obtained, and five times better than the best images of Pluto’s cousin Triton, Neptune’s large moon, obtained by Voyager 2 in 1989. These images were made with the telescopic Long Range Reconnaissance Imager (LORRI) aboard New Horizons, in a timespan of about a minute centered on 11:36 UT on July 14 – just about 15 minutes before New Horizons’ closest approach to Pluto – from a range of just 10,000 miles (17,000 kilometers). They were obtained with an unusual observing mode; instead of working in the usual “point and shoot,” LORRI snapped pictures every three seconds while the Ralph/Multispectral Visual Imaging Camera (MVIC) aboard New Horizons was scanning the surface. This mode requires unusually short exposures to avoid blurring the images. Mission scientists expect more imagery from this set over the next several days, showing even more terrain at this highest resolution. New Horizons, speeding through deep space at more than 32,000 miles per hour, is approximately 104 million miles (167 million kilometers) beyond Pluto and 3.2 billion miles (5.2 billion kilometers) from Earth. All spacecraft systems are healthy. New Horizons is part of NASA’s New Frontiers Program, managed by the agency’s Marshall Space Flight Center in Huntsville, Alabama. The Johns Hopkins University Applied Physics Laboratory in Laurel, Maryland, designed, built, and operates the New Horizons spacecraft and manages the mission for NASA’s Science Mission Directorate. The Southwest Research Institute leads the mission and mission science, payload operations, and encounter science planning. Layered Craters and Icy Plains: Pluto’s rugged, icy cratered plains include layering in the interior walls of many craters. Layers in geology usually mean an important change in composition or event, but at the moment New Horizons team members do not know if they are seeing local, regional or global layering. 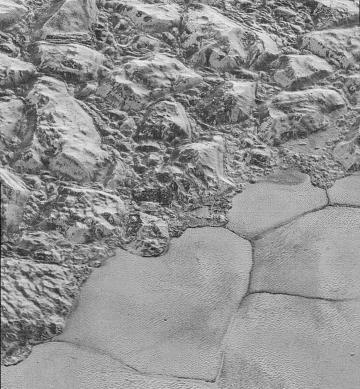 Pluto’s Badlands: Erosion and faulting has sculpted portions of Pluto’s icy crust into rugged badlands. The prominent 1.2-mile-high cliff at the top, running from left to upper right, is part of a great canyon system that stretches for hundreds of miles across Pluto’s northern hemisphere. 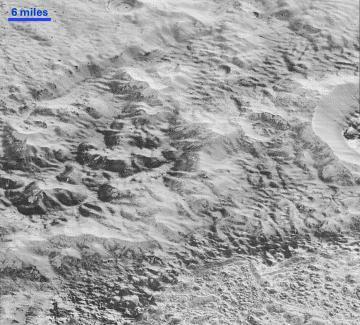 The Mountainous Shoreline of Sputnik Planum: Great blocks of Pluto’s water-ice crust appear jammed together in the informally named al-Idrisi mountains. Some mountain sides appear coated in dark material, while other sides are bright.